The weather and setting were picture-perfect for the Anne Gribbons clinic held the weekend of Dec. 2-3 at IDA (International Dressage Academy) Farm in Wellington’s Little Ranches neighborhood. The blue sky sported puffy clouds, and a delightful breeze underscored the 80 temps. More than 60 auditors sat around the covered arena where Gribbons worked with the riders, seven each day, who entered the arena as the previous rider finished. A native of Sweden, Anne was a member of the USET PSG-Intermediaries squad at the North American Championships in 1985, the World Championships in 1986, and the Pan Am Games silver medal team in 1995. Among other honors, she served on the FEI Dressage Committee from 2010 to 2013 and was North American representative to the FEI World Cup Committee from 1994 to 1997. 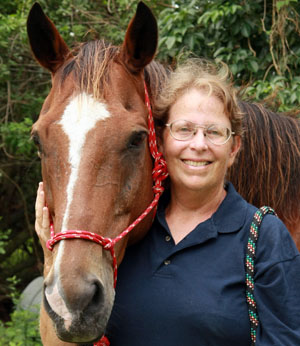 A licensed USEF Senior judge and an FEI 5* judge, she has officiated at numerous CDIs, Olympic and Pan Am trials. In 2013, she was inducted into the USDF Hall of Fame. Carolyn Goff on Dolce was Saturday’s first rider. Anne guided the pair through a series of zig-zags at the half pass as a way to improve their balance, ending the 45-minute session, as always, by asking Carolyn if she had any questions. There were some things that surprised her about the experience. She felt the experience was very useful. During the lunch break, riders and auditors enjoyed the provided lunch at tables set among the vendors’ displays. She was quite pleased with the event. Clinic organizers Randee Leoni and Renee Isler also thought the clinic had gone well. For more information about IDA Farm, visit www.idafarm.com. Previous articleMy Grandkids Are Suddenly On The ‘Naughty’ List!